What's this? 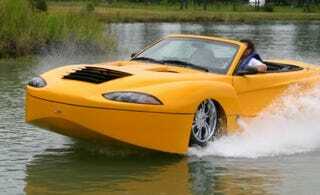 A floating Ferrari? Well, not exactly, but the Hydra Spyder by Cool Amphibious Manufacturers International (CAMI) has a 400hp Corvette engine inside that can pull a water skier and seat four people while going very, very fast. No, this is not that lame Aquacar from years past; this prototype amphibious vehicle can fly both on the water and the road (not in the air, but wouldn't that be cool), where its retractable wheels quickly move up tight into the seaworthy bodywork when it's time to do some motorboating. The company is taking orders now for delivery in six months, and the price? Order one for us and find out.